An obscure painting by the Canadian artist Gustav Hahn (1866-1962) has played a crucial role in unravelling a literary mystery. It’s a story that blends art, poetry, science and history, and involves not only Hahn but also a great American painter from half a century earlier, Frederic Church, as well as the poet Walt Whitman. Hahn’s painting depicts a neighbourhood in Toronto’s west end on a winter evening in 1913. At the bottom are a row of houses; above, we see the stars of the winter sky, including the constellation Orion. But the most striking element is a series of bright objects — apparently a stream of meteors — streaking across the sky. Hahn was an amateur astronomer as well as a painter, and his father, Otto Hahn, owned a valuable collection of meteorites. It’s the depiction of the meteors that caught the attention of Donald Olson, a physicist at Texas State University. Olson, 62, is known as the world’s leading practitioner of “forensic astronomy” — examining classic works of art and literature that include depictions of, or references to, the sun, moon, stars and other celestial phenomena. Olson uses the methods of modern astronomy to determine precisely where and when a particular work of art was created. An example: Olson has analyzed Van Gogh’s Moonriseand found the exact spot in France where the painter was standing, as well as the precise time — 9:08 p.m. on July 13, 1889. He has also examined the photographs of Ansel Adams, and several astronomical references in literature, from ones in Chaucer’s The Canterbury Tales to Julius Caesar’s account of his invasion of Britain. Olson hasn’t deduced exactly where Hahn was standing when he observed the meteors, though he’s happy to entertain suggestions. The caption on the frame of the painting, which misspells Hahn’s first name, simply says: “Meteoric Display of February 9, 1913, as seen near High Park. 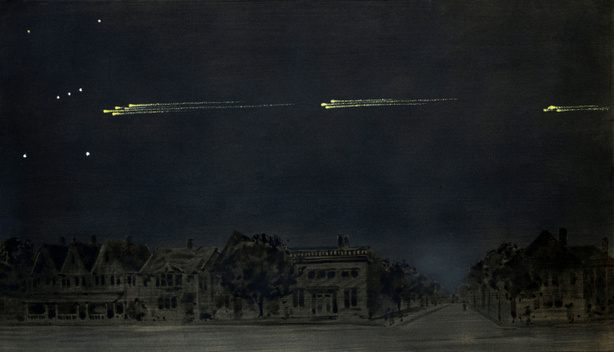 Drawn by Gustave Hahn.” But what intrigued Olson about the painting was the rarity of the event that it seems to depict: a “meteor procession.” A meteor procession happens when a meteor grazes the Earth’s atmosphere at a low angle, breaking into fragments that partially burn up before returning to interplanetary space. Meteor processions are so rare that only four cases are known: the first in 1783, the last the one depicted in the Hahn painting. The painting, formerly on display at the David Dunlap Observatory, is now housed in the University of Toronto Archives. Chant’s report on the event, published in a Canadian astronomy journal, included a reproduction of the Hahn painting. That’s where Olson first saw the image. But he soon moved on to other projects, and tucked the Hahn painting away in his mental filing cabinet of noteworthy astronomical events. Then, in 2000, he stumbled upon a very similar image from a half-century earlier. It was in a catalogue for an art exhibit featuring the work of Frederic Church, of the Hudson River School of American landscape painting. The painting, called “The Meteor of 1860,” shows a tranquil riverside scene in late evening, with a bright array of meteors slicing across the sky in a gently curving horizontal path. Enter the poet, Walt Whitman. Olson had long been intrigued by one of Whitman’s poems, a remarkable work with the intriguing title “Year of Meteors (1859-60).” Published in his famous Leaves of Grass collection, the poem contains several references to astronomical events, including a “meteor-procession dazzling and clear shooting over our heads,” and a comet “that came unannounced out of the north flaring in heaven.” Olson had wondered: What comet? What meteors? But the meteors were tougher. Previous scholars came up with various theories: the 1833 Leonid meteor shower; the 1858 Leonids; and an unusually bright meteor — a fireball — seen in 1859. But there was a problem with each of these guesses; either the year or the visual description was wrong. Olson is publishing his analysis in the July issue of Sky & Telescope magazine, to coincide with the 150th anniversary of the 1860 meteor event. For Olson, there’s the satisfaction of solving yet another “forensic astronomy” mystery — one that would not have been illuminated without the catalyst provided by a nearly-forgotten Canadian painting in a Toronto archive.